Written by Peter Conrad Well, it´s been a few days since I drove to Play Bonita and I found out about that beautiful-unusual place. 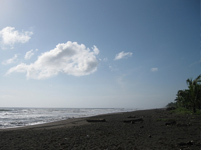 However, the locals in Limon told me that I couldn´t go to the beaches on south, if I haven’t visited “playa Moin” as one of the destinations in my Costa Rica travel vacations agenda; So, I did. Moin is about five minutes from playa Bonita, but it´s a completely different scenario. As I told you on my first piece, playa Bonita is getting attacked by people making restaurants, and buildings around the beach; well, Moin is the opposite. Moin remains as a virgin place where there are barely places where to eat or where to shop; that´s one of the attractions in costa rica; the fact that the sand and the sea. The all inclusive vacations costa rica probably won’t take you to Moin, but the street to get there is between the beach to one side, and a sweet water river on the other. If your thing is to have a costa rica adventure travel, then the trip thru the river via a small boat is for you. To be honest, I wasn’t an expecting to find something like this near a beach, so I went down to surf, have a good time, but late in the afternoon I took the trip down the river, you know, to see something new. This beach is something different. Black sand, with a lot of tree sticks around, and at least 10 kilometers of beach with very, and I mean very little people around… which to me is awesome. After dropping a few waves in Moin, I stopped in one place, kind of an “inside-dark restaurant” where I ate a local food named “Rice And Beans”; it’s made with coconut milk, and to it´s the greatest meal I have ever tasted in the world.